There are two schools of thought on the Yorkshire Terrier: (1) he is a vigorous terrier; (2) he is a delicate toy dog made for pampering. The owner's view of him has much to do with how an individual dog turns out. For certain, the Yorkie is lively and inquisitive, physically and mentally quick, and spends much time trotting (or dashing) around checking things out. Larger dogs may view him as a delicacy, so he must always be leashed or fenced for his own protection; in addition, he can be an excitable chaser of birds and butterflies. A lover of comfort, the Yorkshire Terrier enjoys cuddling on laps and snuggling into soft pillows. Keen of eye and sharp of tongue, he won't fail to announce strangers, often in a high-pitched voice. Early socialization is required so that he doesn't become too shrill. Though he can be bossy and scrappy with other dogs, especially larger ones, Yorkies coexist well with other pets, but are typically overwhelmed by the roughhousing and mischief of small children. This is especially true of the smallest Yorkies -- larger individuals are sturdier. Some Yorkshire Terriers are bright and quick to learn, while others are rather willful and opinionated. Yorkies often dislike walking on a leash and may dart to and fro until taught how to behave. Housebreaking is notoriously difficult with Yorkshire Terriers, especially in cold or wet weather. Consider an indoor litter box, or a doggy door leading out into a small covered potty yard. Barking must be controlled from day one, and this spunky little fellow often must be taught that possessiveness of his food and toys is a no-no. A Yorkshire Terrier may be right for you. A Yorkshire Terrier may not be right for you. Grooming. Without frequent brushing and combing, Yorkshire Terriers become a matted mess. If you can't commit to the brushing, you have to commit to frequent trimming to keep the coat short, neat, and healthy. You can even shear the coat very short with clippers and then you won't need to brush it at all. Personally I love this sheared cut because it's so easy to care for and makes a Yorkshire Terrier look like a cute puppy throughout his life. Fragility. Too many people acquire a toy breed puppy without understanding how incredibly fragile a toy breed is. You can seriously injure or kill a Yorkshire Terrier by stepping on him or by sitting on him when he's curled under a blanket or pillow, where he frequently likes to sleep. And Yorkies can seriously injure or kill THEMSELVES by leaping from your arms or off the back of your sofa. A larger dog can grab a Yorkshire Terrier and break his neck with one quick shake. Owning a toy breed means constant supervision and surveillance of what's going on around your tiny dog. Yorkshire Terriers must always be kept on-leash -- they are just too easy to injure when not under your complete control. Yorkies are NOT suited to young children, no matter how well-meaning the child. Children cannot help being clumsy, and that a child meant well is little solace to a Yorkshire Terrier who has been accidentally stepped on, sat on, rolled on, squeezed, or dropped onto the patio. Most Yorkies feel overwhelmed by the loud voices and quick movements that children can't help making -- and stress and fearfulness (even defensive biting) may be the result. Housebreaking issues. As a behavioral consultant, I put the Yorkshire Terrier on my Top 5 List of "Hardest Breeds to Housebreak." If you live in a cold or rainy climate, housebreaking will be especially difficult, because Yorkies hate both the cold and the rain. A COVERED potty area is strongly recommended. Sometimes a doggy door is necessary so your Yorkshire Terrier can run outside the moment he feels the urge in his tiny bladder. Read more on housebreaking your Yorkshire Terrier. Providing enough socialization. Some Yorkies are friendly and outgoing, but many have the standoffish or suspicious nature of a true terrier. Thus, Yorkshire Terriers need extensive exposure to people and to unusual sights and sounds. Otherwise their suspicion can become shrillness, or even nastiness. Barking. With their keen senses, Yorkies make excellent watchdogs. However, this can make them too quick to sound the alarm at every new sight and sound. You have to be equally quick to stop them before this tendency becomes an established habit. If that training is to be successful, your Yorkshire Terrier needs to respect you so that he stops barking when you tell him to. You must teach your Yorkie to respect you. A dog who respects you will do what you say and will stop what he's doing when you tell him "No." My book Teach Your Dog 100 English Words, gives you a unique vocabulary to use with your dog AND teaches my Respect Training Program. Your dog will look at you when you speak and do what you say. Not just when he's hungry for a treat or feels like it. But all the time. Because he respects you. Finding a healthy one and keeping him healthy. Many Yorkshire Terriers live a good long life, but unfortunately they are very prone to a severe liver disease called liver shunt. Other health concerns include knee problems that can require expensive surgery. Also low blood sugar, and eye diseases. To avoid these problems, you need to buy your Yorkshire Terrier from a person who can pass the "14 Family Companion Guidelines" in my book, Dog Quest: Find The Dog Of Your Dreams. If they're not following these guidelines, it's a big risk to buy a puppy from them. Once you have your puppy home, you need to keep him healthy by following the 11-Step Health Care Program in11 Things You Must Do Right To Keep Your Dog Healthy and Happy. 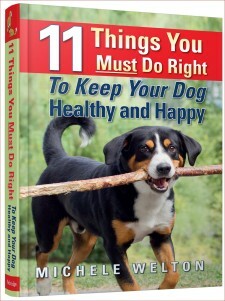 If you want your dog to live a long, healthy life and seldom need to visit the vet, this is the book for you.How to prepare healthy meals, getting only the right vaccinations (not the ones that are either useless or risky), preventing fleas, ticks, and heartworm safely, getting dangerous (to dogs) products out of your home, healing or improving current health issues, and much more. This is my best book, and bargain priced, too!